Grammy-winning superstars of the klezmer world! THE KLEZMATICS erupted out of New York City's East Village in 1986 and revitalized klezmer for the new century. 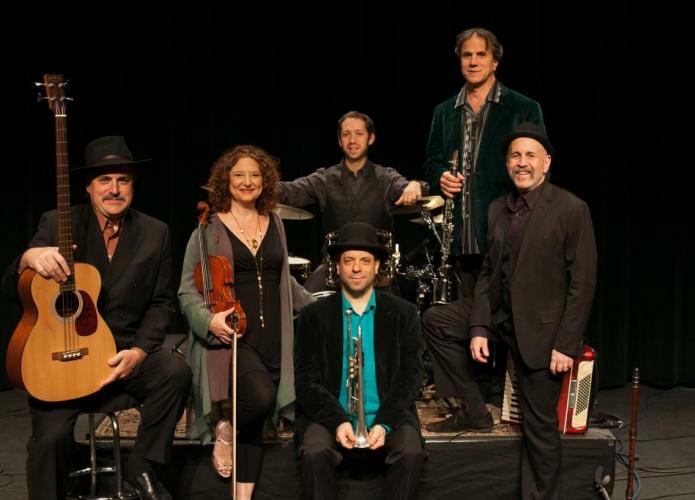 Their klezmer is steeped in Jewish spiritualism and Eastern European tradition, while incorporating more provocative themes such as social rights and anti-fundamentalism with eclectic musical influences such as gospel, punk, and Arab, African, and Balkan rhythms. Over the course of more than twenty years they have released many albums of wild, spiritual, provocative, reflective, and ecstatically danceable music, forever redefining and transcending traditional labels. Today, with three original members -- Lorin Sklamberg (lead vocal, accordion, guitar, piano), Frank London (trumpet, keyboards, vocals) and Paul Morrissett (bass, tsimbl, vocals) -- still on board, alongside longtime members Matt Darriau (kaval, clarinet, saxophone, vocals) and Lisa Gutkin (violin, vocals), the award-winning KLEZMATICS are without a doubt the most successful proponents of klezmer music in the world! THE KLEZMATICS have collaborated with violinist Itzhak Perlman, Pulitzer prize-winning playwright Tony Kushner, Israeli vocal icon Cava Alberstein, and many others. They have performed in more than 20 countries and released 10 albums to date. $30/General Admission. ON SALE NOW!